“This clear moustache wax is slightly harder than normal moustache wax, so it's great in warmer and cold climates - like trips abroad - and it lasts rather a long time. Work your finger around in the tin to create warmth, then rub together thumb and forefinger then apply to your fine moustache” - Mr Natty. Mr Natty gives a small donation to The Hepatitis C Trust every month from Mr Natty sales. FOAD WAX comes in a handy pocket sized, lightweight and durable screwtop ½ oz - 15ml (approx) tin for £4.99 each, and there is a discount for quantities. 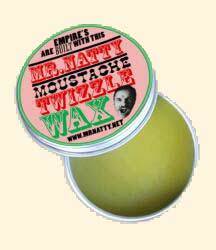 FOAD WAX is home-made and marketed by Patt Foad, moustache aficionado, tamer and Makeup artist for TV and Film. “FOAD WAX is lovingly home made and hand poured. It is naturally coloured by the presence of the Pollen and Propolis in the pure Beeswax, but dries and sets clear. Foad Wax has a light, herbaceous signature scent derived from our own blend of natural essential oils. Foad Wax is considered to be a 'medium to firm wax' and therefore has a medium to strong hold. Please note that due to Beeswax being a natural product, a slight colour and consistency difference may occur from batch to batch. Patt offers a new softer pomade style wax called Toad Satin Wax of which he reports is making a good impression on his patrons and makeup artists on film sets. Toad Satin Wax comes in a handy pocket sized, lightweight and durable screwtop ½ oz - 15ml (approx) tin for £4.99 each, and there is a discount for quantities. P&P same as for FOAD Wax. “Foad's Toad Satin Wax is a Vegan pomade style wax suitable for everyday use. It has a loose to medium hold and a satin sheen finish, and contains Jojoba Wax, Castor Oil, Grapeseed Oil, and a zesty blend of natural essential oils. Jojoba Wax, derived from the Jojoba plant seed, is a natural moisturiser and smooths out the hair cuticles making them shiny and healthy looking. Castor Oil is a natural humectant drawing moisture into the hair leaving it soft, shiny and strong. The Grapeseed Oil is also a moisturising agent and provides the satin sheen. Club Member William Brown reports in his detailed (and name-dropping) product-comparison review below that that Captain Fawcett's is being used on TV and film sets and is a relatively new product. Europe £1.80, Rest of World £2.00. and is neutral in colour. “I came across this wax while on the set of ‘Jack the Giant Killer’, a new feature film starring Ewan McGregor, being filmed partly at Hampton Court. This was being used by the make-up department and they suggested that I give it a try - not that I needed any assistance, as on all shoots, my own styling has always been untouched. “Like most waxes, I found it to be a little too solid and needed to be softened by either the use of a hairdryer or plying between finger and thumb. Unlike ‘Gravy Jay’s’ wax (q.v.) 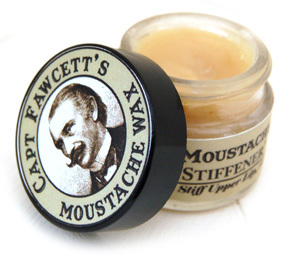 from USA, which comes in a large tin and easy to extract, the Captain Fawcett wax is in a small glass container (looking like something one would buy from Bodyshop). It is well packaged and a good size for travel – which I will come to later. I found the easiest way to extract it was with the back of my nail. Not too sure how this is going to work once I get near the bottom! Unlike ‘Gravy Jay’s’, which has a real pungent petro/chemical smell - one surmises that it is to emulate that smell of straddling your HD FatBoy; for some reason in the States a Harley and graspable extremities seem to go hand in hand - ‘Captain Fawcett's’ has a pleasant aroma, with only a slight chemical nuance. The wax is ideal for that full soft look which I found good for everyday use. “But for my more ‘sculptured’ look which has to stay in all day, it tends to make the shape more compact and with a tighter curl. 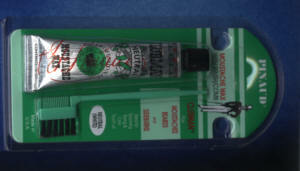 So for this I use another product - ‘got 2b’ by Swartzkopf (a hair spiking glue, aimed at the younger market). This holds it firm and in the same shape all day and rarely needs further attention. The only problem with ‘got 2b’, I found to be at the airport, where it comes in a 150ml tube and exceeds the airport customs requirements. Damm security, whatever happened to common sense and discretion? (In fact Gatwick now has a half full tube of ‘got 2b’!). I think Captain Fawcett’s is a good product for the ‘everyday’ hirsute growth and the price is quite competitive with say, the ‘Gravy Jays’ or even the Kryolan (q.v. ), as usually favoured by make-up artistes. The Kryolan is a completely different product and more in similarity to the ‘got2b’ product which I use-but in a MUCH smaller tube, less cost effective, and undoubtedly airport friendly. 2007 World Champion Moustache expert Ted Sedman offers his comments on other suppliers of Moustache Wax. They are not the official views or recommendations of the Handlebar Club! 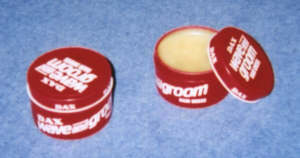 This wax is supplied in one-ounce tins. It comes in three versions: Light wax, Dark wax & Wacky Tacky, all with different aromas but not like a perfume smell. It sets off quite firmly to hold the moustache in shape, especially in hot humid weather conditions. "I have found that the wax is easy to use, and rubs in well without leaving any visible goop. It takes a little while to reassert its stiffness once applied, so a few minutes of light touching and prodding of the 'graspable appendages' is needed to set the desired end result. The wax holds up very well in hot weather. I have actually only had to re-apply once during the day yesterday (one of the hottest days of the year). I also like the smell, honey I would guess." 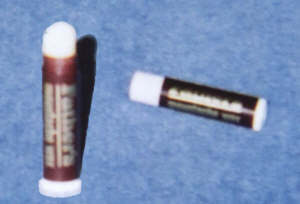 This wax is supplied in half-ounce tubes. It is pleasantly, but not strongly, perfumed. It sets off quite firmly to hold the moustache in shape. Clubman is a very popular wax and I used it successfully myself for a long time, though one or two people have remarked that some tubes they have obtained recently have not worked so well. In the U.K.you can phone the distributor, Visage International, free on 0800 146 615. They "will send you to your nearest stockist or you can purchase the items over the phone with a £2.50 postage and packing charge". For personal shoppers, I recommend Trumpers; the "Barbers and Perfumers to gentlemen of distinction" in Mayfair, London. This wax is supplied in a 10 ml tube. It is available in "Clear" or "Hazelnut". It is pleasantly, but not strongly, perfumed. It sets off extremely firmly. Brother's Love wax is produced in Munich, Germany. It is my personal favourite, but I have to admit that some members of the Handlebar Club dislike the way in which it makes the moustache very stiff. This wax is supplied in the form of a 1/8 ounce stick. It "comes in a neutral shade for any hair color". It has an aromatic perfume. 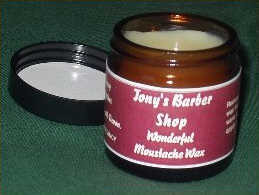 Father's is the favourite wax of one of our American members, who introduced it to other members of the Handlebar Club. in a pocket so you have the wax when you need it". It is a pale honey colour. It has a pleasant lavender fragrance. It has good holding power to keep the moustache in shape. This wax is sold in a one ounce tub. Conk's moustache wax is not one that I have tried myself, but according to someone who has, it has a light, pleasant, honey-like scent. He says that it is very soft, on the greasy side, and did not provide much hold in his case. Because it is petroleum based, it does not wash out with water. Note that Col. Conk's web site has much more than just the moustache wax, including "moustache combs and scissors, as well as fine bristle shave brushes, straight razors from Germany, shave soaps, shave cups, and many other items for the discerning gentleman customer". Another informant "heartily recommends all of the shaving products, as they are top notch and produced in the tradition of the Victorian era." 1.3 fl oz (40 ml). Its colour is almost clear. It has good "holding" power to keep the moustache in shape. This French wax is highly recommended by our Club secretary. This product is supplied in a 3.5 oz (99 gm) tub. It is quite soft in terms of holding the moustache. Dax is not sold as a moustache wax, but as a hair dress. However, several Club members appreciate its inexpensive price and find it very good just for keeping the ends of hair under control. We use the product that comes in a red tub, which is "made especially for short hair", but that doesn't prevent it being effective on some rather long moustaches! This wax is supplied in an 8 ml tube. It is almost white in colour. It has an unusual, though quite pleasant, perfume. Note that the "Stern" web site also carries various moustache accessories - it is the only place that I know of that advertises a snood, (although they refer to it as a "moustache band"). This wax is supplied in the form of a stick. It comes in a range of colours: brown, black and neutral. At present we have no further details. This wax is supplied in a one ounce tin. It is said to be "lightly, pleasantly scented" with natural musk oil. It is not water-based, and so "does not easily melt in hot beverages"
They also supply moustache brushes. This wax is supplied in a two ounce tin. It is "natural in colour". It is unscented and totally odorless. It has a good "hold". I am told that this is a very firm wax which requires you to rub a bit onto your finger and thumb and work it by rubbing between them to soften it up before applying. My correspondent says that it is a bit more work than Clubman but it has a superior hold once it is applied. Someone else tells me: "When you rub it between your fingers, it will soften nicely, but if rubbed too much or for too long, the wax will turn white. This white color remains when you apply it you your moustache. I'm guessing that rubbing induces air into the product perhaps? If I hit the wax with my hair dryer, it will melt and turn clear again. But It doesn't take much effort to turn the product white." It is pale honey in colour, though it dries clear. Richard Stooksbury advises that it requires special attention in the application, unlike any other wax that he has ever used. His main observation is that it is absolutely NOT greasy in any way, shape, or form, and he says that the hold is superior to almost every other wax that he has tried. Another correspondent who thinks it is an "excellent product" says, "I find that it works best after being heated up, applied and then brushed in". On the other hand, two other people have told me that they simply can't get it to work, so this just goes to prove that these things are very much a matter of personal taste. but has a very soft holding texture. The premises of this supplier are actually in Jermyn Street, not Old Bond Street. Mr. Taylor's Moustache Wax is also available from The Gentleman's Shop in Hungerford, Berkshire. 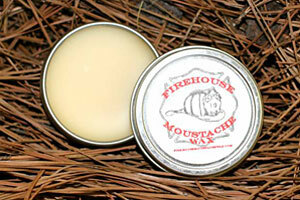 This wax is supplied in a 100ml tin. It is very lightly scented. It sets off quite firmly to keep the moustache in shape. This is supplied in a three ounce container. It has very good "holding" power to keep the moustache in shape. Dave says that (as far as he can tell) it contains no oil and is basically just wax and as a result, holds extremely well. 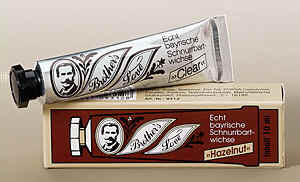 This wax was recommended by Barbara, who wrote:- I have been buying Cook and Bates Mustache wax for my husband for over 15 years. We use that product because my husband loves it. He has tried them all and this one works the best for him. Unfortunately is is no longer available. But see the next item. Our first recommendation via the Message Board! 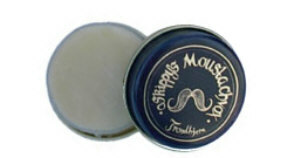 "Cook and Bates is the company that made Brut mustache wax. After they stopped making wax for Brut, The Bassett Company made it using the same formula. You can now get the neutral wax on eBarbershop.com. I used Cook and Bates wax for over 10 years and loved it. I now use the neutral wax by Bassett." Gravy Jay's is under new ownership, and available again! "Coming soon is a creamier wax and different sizes!" Order online by Paypal, or by mail with Postal or Certified Money Order. "This is the original formula wax which uses essential oils for a stiff wax that holds all day, and has a sweet smell that's not overpowering." "It is a wholly natural wax. The wax is lightly scented and honey coloured. It has a soft as opposed to stiff hold and is particularly well priced." Tony has been making it for about ten years and does it all himself locally in Devon. His grandfather and father were both barbers and the recipe has been passed down. His shop's web site is www.tonysbarbershop.co.uk Click on the "Moustache Wax" link at the left. This wax is sold in a one ounce tin. 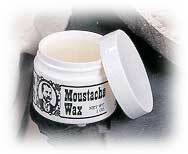 It is claimed to be "An excellent wax which will hold the most unmanageable moustache in place all day". 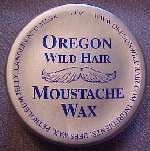 I am told that it is "similar to Oregon Wild Hair though not as malleable"
Handlebar Club member James Ross says, "I love this wax because it has great hold, very refreshing fragrance (from Sandlewood and Patchouli oils), comes in a handy tin and finally, it is worth the price." The product is sometimes available on eBay. This wax is supplied in a 1.7 ounce push-up stick container. Scent is "a very light coconut"
Its "holding power" is "somewhere between stiff and soft"
The manufacturer's web site is at www.Getluckytiger.com, though I am told by another correspondent that it is available with lower shipping fees from Weiss Barber Supply Co. in Wichita. Their e-mail address is weissbarberusa@aol.com. 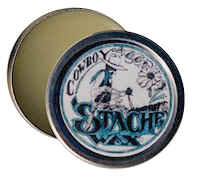 This wax is supplied in a 15 gram container, "designed to be easy to carry wherever you go". It is clear, but other colours (eg black) could be made available. The wax is water-soluble and unperfumed. Developed in Finland in 1923. The manufacturer's web site is no longer maintained. This is a company in in Shepherds Bush, London and Mike (in Wales) tells me that they supply a Kryolan wax, which is "not dissimilar to Stern". It comes in a 0.2 fl. oz tube. It's pleasantly scented, though Mike is unable to identify the perfume. It has a good, firm hold. The Kryolan wax is listed on their website at www.makeup-provisions.com. "It's a little on the pricey side, but a little goes a long way. It's a good "molder" by itself, and it's also good with a curling iron. It has to be used exactly the way the directions state, so that it completely disappears into the hair. I always preferred my husband to use that instead of wax because it seemed to me that the wax would cause a buildup, but the mud wouldn't. The molding mud has a light fragrance, but I think it pretty much dissipates after a while. He never complained about it." 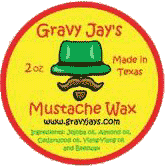 Many thanks are due to Richard Stooksbury of Nashville, Tennessee, for the research that provided the basis for this page of links to suppliers of moustache wax. However I take responsibility for all the expressions of opinion, and also for the mistakes. If you have any comments, suggestions or additions, or if you know of any other brands of wax, please post a message on our Forum. Incidentally, the fact that a manufacturer's site is listed does not mean that it is worth visiting! For example, one contains pictures of all the manufacturer's products. But when you click on a picture, expecting to get information about the product, all you get is a larger version of the picture!